Members of the Islamic Society of Portland say they continue to feel safe despite the threat of bloodshed in August. Portland police have opened a hate crime investigation into a menacing letter sent to an Islamic center in the city. The letter arrived at the Islamic Society of Portland on Tuesday, threatening bloodshed in August. Detectives are examining the note and say the postmark indicates it was mailed from outside the United States. Police Lt. Robert Martin said detectives are working with a local postal inspector to determine the origin of the note. He would not say where officials believe it came from. Martin also said the note will be turned over to the state Attorney General’s Office to determine whether it has links to similar threats against Islamic centers or mosques around the country. He said the threat is considered a hate crime because it targeted a group of people based on their religion. The designation means a perpetrator can face additional punishment if convicted. Imam El Harith Mohamed said Muslims who pray at the mosque at the edge of the city’s downtown won’t let fear dictate how they interact with others or conduct themselves. Mohamed came to Portland from a mosque in Virginia, where he said the relationship with the community was not good and the mosque had a formal security structure. “I could not say to my neighbor, ‘Good morning.’ He would not respond,” Mohamed said of his former home. In the past few days, he has suggested that worshippers at the Islamic Society step up security in response to the note. They have declined, Mohamed said. And, for the recently concluded holy month of Ramadan, the mosque kept its doors open overnight for worshippers who wanted to pray, Mohamed said, and worshippers never felt threatened. The 500 or so members of the mosque feel safe in Portland, Mohamed said, and they don’t want to allow a threatening letter to change that. Zacharia Addan, who stopped in at the Islamic Society to pray Thursday afternoon, echoed that belief. 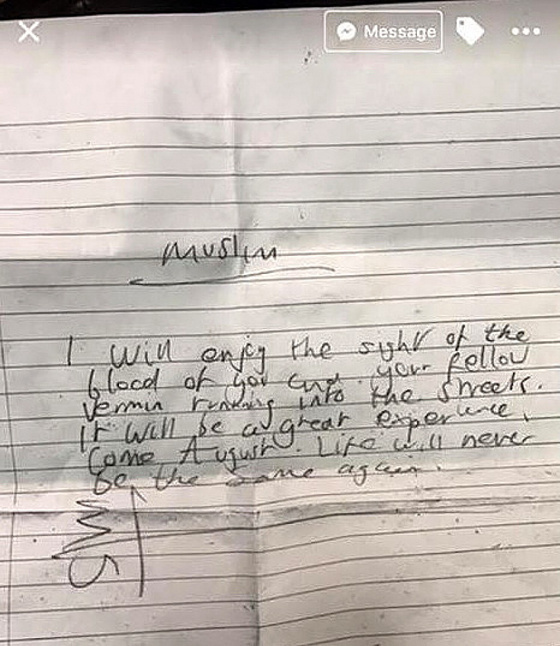 Ahmed Shuieb Yusuf, the president of the Islamic Society, said it can be frightening to receive such a hate-filled letter, but members of the mosque won’t let it change how they feel about their community and how they practice their faith. Both Mohamed and Yusuf said they picture the person who sent the note as someone who’s been watching TV programming that conveys anti-Muslim messages. Martin said police spoke with members of the Islamic Society after the letter was turned over, but investigators also were told that the members of the mosque don’t want it to change how they interact with the larger community. “It’s still concerning,” Martin said, but police believe they have a good relationship with local mosques and can step up their patrols in response to threats. He noted that police increased their drive-bys of mosques during Ramadan, just as they do at churches around Christmas. While members of the Islamic center said they have not felt threatened before, the note is the latest anti-Muslim message circulated in the Portland area in recent months and years. In April, an anti-Muslim statement was written on a poster in Luther Bonney Hall on the Portland campus of the University of Southern Maine. The statement was written on a poster that advises students what to do in case there’s an “active shooter” on campus and said “Kill the muslin,” misspelling the word Muslim. Last November, USM officials reported that the Latin phrase “Deus Vult” or “God Wills It” had been written on a desk and a wall at the Woodbury Campus Center, according to student leaders. The phrase was used as a rallying cry for Christians during the Crusades in medieval times, and more recently has been adopted by the alt-right white nationalist political movement as an anti-Muslim insult. 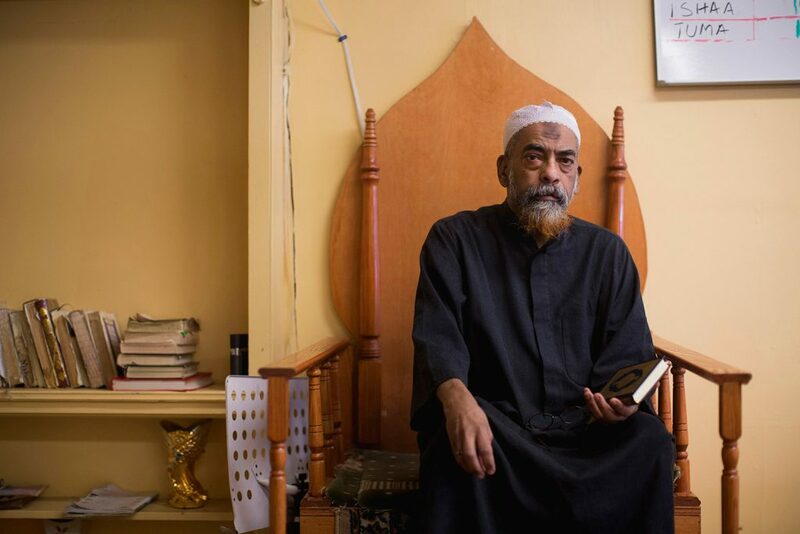 Last August, fear rippled through the Muslim community in Westbrook after the discovery of several typewritten messages that read: “All Muslims are Terrorists should be Killed.” Police closed the investigation without finding out the source of the notes. The incidents reflect a national trend. In 2015, the FBI reported 5,850 hate crimes across the country. Anti-Muslim bias was determined to be the motive in 257 cases. Those numbers are likely low. A 2013 Justice Department study indicated two-thirds of all hate crimes are not reported to police. Data on their prosecution are also limited and nationally inconsistent.